ELVIS IS BACK: LEGACY EDITION 2-CD Set In Stores March 1st! CD ONE: ELVIS IS BACK (1960) with “Fever,” “Such A Night,” “Reconsider Baby” – plus singles “Stuck On You,” “It’s Now Or Never,” “A Mess Of Blues,” “Are You Lonesome Tonight?,” “Surrender” – and more! CD TWO: SOMETHING FOR EVERYBODY (1961) with “There’s Always Me,” “I’m Comin’ Home,” “I Slipped, I Stumbled, I Fell,” “Sentimental Me” – plus singles “I Feel So Bad,’ “(Marie’s The Name) His Latest Flame,” “Little Sister,” “Good Luck Charm” – and more! Two words exploded worldwide on December 19, 1957 – “Elvis Drafted!” – but three words resounded across the universe even more explosively on March 3, 1960: “Elvis Is Back!” The album that Elvis Presley began recording in Nashville on March 20th, and finished in the legendary overnight session of April 3-4th, is widely regarded as possibly the best album he ever made. A half-century later, Elvis Is Back is now coupled with 1961’s Something For Everybody, an album he recorded back in Nashville one year later. Along with one dozen hit single sides recorded (also in Nashville) and charted over roughly the same period of time, the deluxe ELVIS IS BACK: LEGACY EDITION will be available at all physical and digital retail outlets starting March 1, 2011, through RCA/Legacy, a division of SONY MUSIC ENTERTAINMENT. 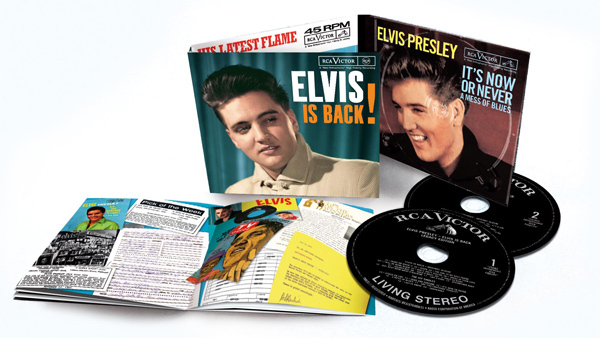 ELVIS IS BACK: LEGACY EDITION follows the template of the recent RCA/Legacy releases, From Elvis In Memphis: Legacy Edition and On Stage: Legacy Edition. With each title, the definitive version of one of Elvis’ most essential albums has been expanded to include another historically significant album from the same time period, along with the hit singles associated with both albums. Joining Elvis for his sessions at RCA’s Studio B in Nashville were his long-time guitarist Scotty Moore, drummer D.J. Fontana, Floyd Cramer on piano, guitarist Hank Garland (also on bass), bassist Bob Moore, and drummer Buddy Harman, plus the Jordanaires on harmony vocals. Among the six masters they cut that night were Elvis’ first post-Army #1 million-selling single “Stuck On You,” and three tracks that would be chosen for the new album. They reconvened two Sunday nights later on April 3rd (adding saxophonist Boots Randolph to the lineup) and finished an astounding 12 tracks. The unprecedented results included Elvis’ next two #1 million-selling singles, “It’s Now Or Never” and “Are You Lonesome Tonight?” plus the nine tunes needed to complete the LP. Elvis Is Back was rush-released days later on April 8th. Any concerns about Elvis’ ability in the studio after more than two years away were set aside forever. After spending the rest of 1960 in Hollywood filming and recording the sound¬tracks for G.I. Blues, Flaming Star, and Wild In the Country, Elvis returned to Studio B on Sunday night, March 12, 1961. With the exception of “I Slipped, I Stumbled, I Fell” (imported from the Wild In the Country tapes), the other 11 tracks on Something For Everybody were all finished on that equally legendary overnight session. Among them were Elvis’ takes on “I Feel So Bad” (from Chuck Willis) and “I’m Comin’ Home” (from Charlie Rich). Elvis’ next batch of hit singles were recorded at Studio B in June (“(Marie’s The Name) His Latest Flame” b/w “Little Sister,” both sides penned by Doc Pomus and Mort Shuman); and October (“Good Luck Charm” b/w “Anything That’s Part Of You”).